There has always been lots of turn around in Old Town Scottsdale. Bars come and go, a few manage to stick around. One of the newer locations in Old Town is Social Tap. Located in what used to be Mickey’s Hangover, Social Tap Scottsdale is the company’s 3rd Social Tap location. The other 3 are located in Southern California. 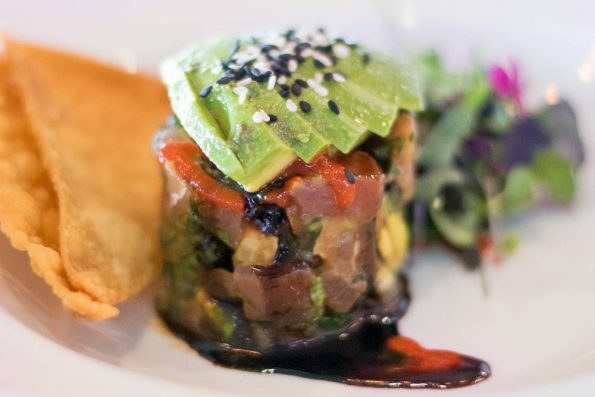 Ahi Poke- The Ahi Poke is comprised of Ahi Tuna, cucumber, cilantro, green onion and an Asian marinade that contains sesame oil, house made teriyaki, cilantro and lime juice. We have totally latched on to the poke trend that is consuming the nation. We can’t get enough of it! The Ahi Poke is one of Social Tap’s most popular menu items and its definitely easy to see why after you try it. It has the right amount of heat (we like it spicy) and the cilantro is not hidden (no cilantro haters here) which makes for a perfectly balanced bite! 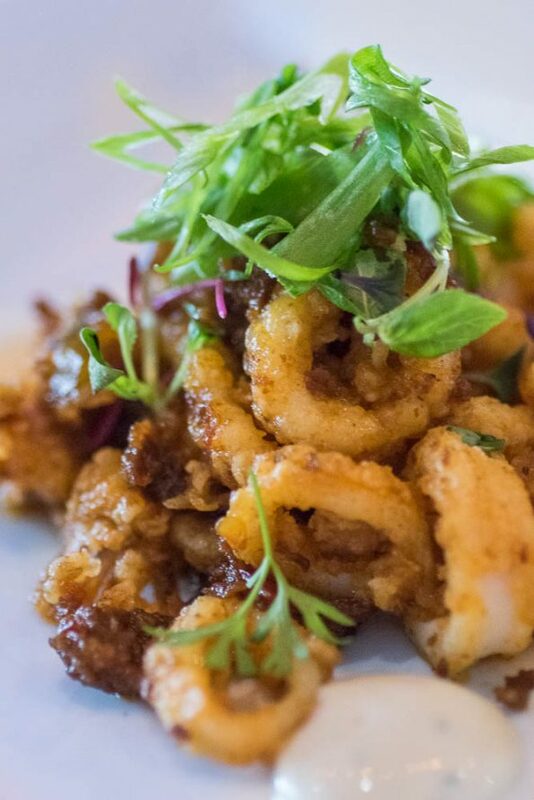 Cali-mari- Social Tap’s version of calamari takes a different approach than most restaurants. Rather than serving it with lemon and marinara, they serve it fried and sauteed with chorizo, peppers, and sweet chili sauce. Then it is topped with a sriracha aioli. First off sweet chili sauce on anything is a winner in our book (try it on french fries, you can thank us later). Also the use of a sriracha aioli as opposed to a marinara gives the calamari a completely different profile and it is wonderful. 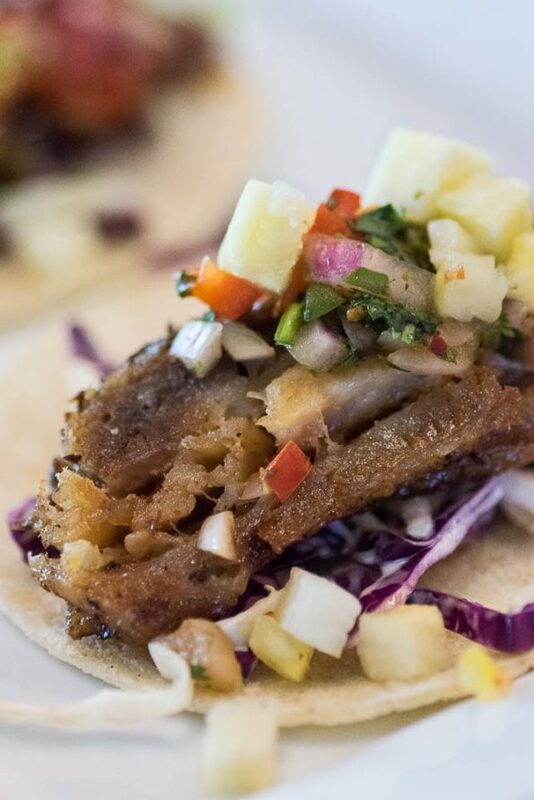 Pork Belly Tacos- Now if we are served tacos, it is pretty much guaranteed that they will make it to our favorites list. Have you met us? However, these Pork Belly Tacos made it to the list out of 3 tacos that we tried, so these were really special. They are served with crispy pork belly, pineapple salsa, and a chipotle aioli. Crispy pork belly is almost cheating, but theirs was very crispy and packed full of delicious flavor. The creaminess of the chipotle aioli toned down the sweet of the pineapple salsa. This trio of salty, sweet, and creamy created the perfect trifecta of taco flavor balance (did we mention we love tacos?). We really enjoyed Social Tap. We are told that their chicken wings are pretty legit so we will be stopping by to try those before too long. Also, for all of you trivia buffs out there, they do Trivia Night every Wednesday. So put on your thinking cap and head on over! They really go above and beyond your traditional bar food, not to mention they have a great selection of draft beers to choose from! Have you been to Social Tap? What’s your favorite thing on their menu? Leave your favorites in the comments below or use the hash tag #GeekEats!